Back in 1990, I was on a family vacation with my Dad’s side. We were in Houston, visiting friends, but all I could think about was getting into a R-rated movie called Night Breed. You see, in 1990 I was thirteen years old, which meant films with the dreaded R were off-limits in Canada until I turned eighteen. That was the law. But I was a Clive Barker fan, I had read his short novel Cabal and I was desperate to see the film. So, I managed to convince my Dad, who had picked up a nasty bug on the trip, to take me to some movie theatre and sit with me through Night Breed. That’s what Dad’s are for, right? Of course, he hated it. “It wasn’t even scary,” he said when we walked out of the theatre. Craig Sheffer tries to get David Cronenberg to explain Naked Lunch to him. That was my first experience watching Night Breed. And even though Dad didn’t dig it, I did. I loved the story of Boone (Craig Sheffer), accused of being a serial killer and who is accepted by a group of monsters who live in Midian, outside Calgary. I loved David Cronenberg in his first acting endeavour, playing psycho psychiatrist Dr. Decker. I loved the cornucopia of creatures Clive Barker featured as he directed the film he first wrote. What I didn’t know at the time was that Night Breed wasn’t what Barker’s original vision was. No, his was something much grander, but, because of studio meddling, it wasn’t meant to be. For years there was talk that Clive Barker had to cut significant portions of Night Breed to please the studio, Morgan Creek. The cuts transformed the film into something less than what he had envisioned. The story was shuffled and changed, characters who originally lived were killed, and those that were killed in the first cut managed to live another day in the final. Essentially, the version of Night Breed that made it to cinemas twenty-two years ago was a watered down, distilled and destroyed version of what Barker wanted us to see. Now, Mark Miller, who helps run Barker’s production company Seraphim Films and Russell Cherrington, senior lecturer at the University of Derby, have managed to piece together from various sources what is known as Night Breed: The Cabal Cut, which recently screened in Toronto at the TIFF Lightbox, thanks to the fine folks at Rue Morgue, and with Miller and Cherrington in attendance. This version run 155 minutes and essentially makes Barker’s film whole. Added in are various scenes that add more story and character depth, along with a greater trip through the monster city of Midian. As a longtime fan of the book and the film, flawed as it was in its original form, it was quite exciting seeing this new vision finally play out the way Clive Barker always envisioned it. It’s not a perfect film, but it’s not a perfect script. Far from it. And I don’t necessarily think the new version is going to change someones mind if they didn’t like the original, though it does have a stronger story than the original. As well, there are a few scenes I never needed to see (sorry guys, the musical number just doesn’t it cut it for me). But what makes Night Breed: The Cabal Cut so remarkable, so essential, is that it gives us what Clive Barker wanted to give us all those years, for better or for worse. If a studio hires a director to adapt their work, as Morgan Creek did in this situation, he should be allowed to do the work. And judging by the Cabal Cut of Night Breed, whether the studio liked it or not, it never appears as though Barker didn’t have a grasp on what he was doing. At the end of the day, I’m happy that there’s a proper version of Night Breed out there (big props to Russell Cherrington and Mark Miller for their determination and great work). Now it just needs to get into the hands of the fans, but it’s not easy. Miller and Cherrington need the money to extensively clean up and restore the found footage, which is the only way Morgan Creek will put out an Extended-Cut Blu-ray. 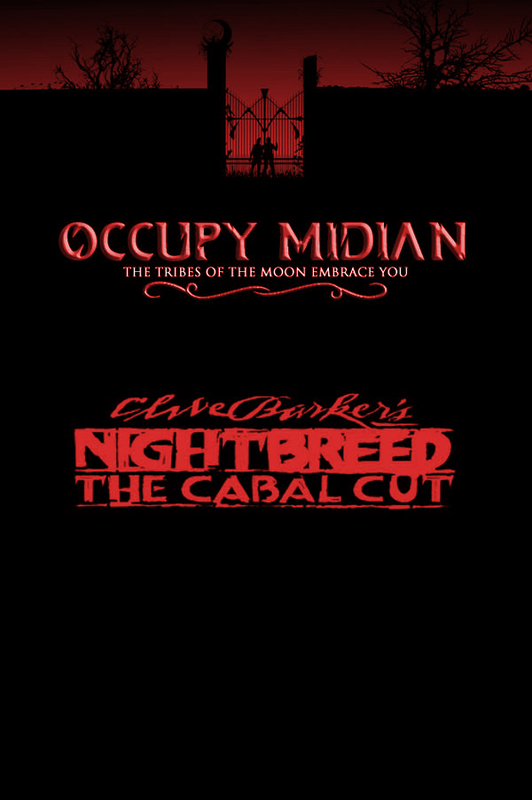 The duo have been drumming up support, taking the film to various cities and encouraging fans to sign the petition at Occupy Midian. I hope it happens – I’d certainly watch a pristine version of the film. Pretty sure my Dad won’t. Pingback: 31 Days of Horror: Surviving Nightbreed « Biff Bam Pop!